Each summer the Street Art Doping Festival invites Europe's top street artists to leave their large scale marks around town. Examples of their murals can be seen at ul. Racławicka 17 (F-15), ul. Rakowiecka 2C (G-13) and ul. Bliska 23 (in Praga Południe) respectively, also, if you stick to the length of ul. Stalowa, to your left and right, you'll frequently see murals. Home-grown work can also be seen all around the city, with the more down at heel districts of Praga and Wola being particularly well represented. Keep your eyes open for the projects of sweetly subversive local heroine NeSpoon; her stencil series - based on motifs of traditional Polish lace designs - is often seen in the unlikeliest of places. Similar works by local artists SC Szyman and Simpson can also be found around the city. If it's something you're interested in, we highly recommend you check out some street art in Warsaw, but be quick, one of our favourite murals of a castle in the sky, once located on ul. Mińska 12 (Praga Południe) is no more - gone with the building it was painted on! At any rate, those with an interest in street art will have little trouble tracking it down in Warsaw, and we’re making it even easier. 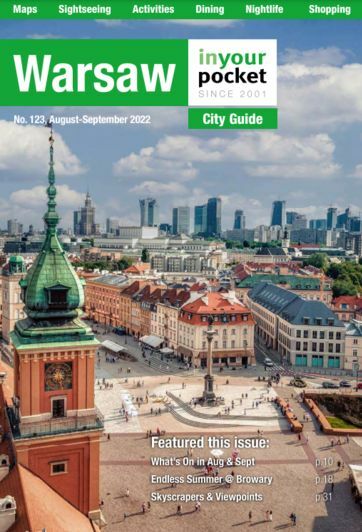 In addition to cataloguing and GPSing street art addresses throughout the city centre below, we’ve also marked each place with a spray can symbol on the maps in the back of our print guide, so you can literally use them to give yourself a tour of Warsaw’s urban art. We’ve also put it all online with GPS coordinates so that your smartphone can do the work for you. We encourage you to do just that, and check out some of Warsaw’s alternative art. Although a sponsored ad by the Discovery Channel, this mural looks quite nice and colourful, showing the theme of 'passion - a way of life'.